Fall in Yellowstone Country is like a heavyweight title fight between two legendary contenders, Summer and Winter. You never know how the fight will unfold, but you always know who will win. Some years it’s a long, punishing slugfest. On other years, it’s a quick KO. Either way, Winter always emerges victorious in the end. This year the battle began with Winter taking a surprise cheap shot at Summer before they even bumped gloves at the center of the ring. A strong storm brought rain and snow to Yellowstone Country in the end of August, and the fight was on. September was a blow for blow bout between cold, wet storms and brilliant blue, sunny skies. As we begin October, Winter has Summer up against the ropes, and looks to be dealing a round of punishing body blows. The upcoming forecast is showing a prolonged period of storms beginning this weekend and lasting through next week. High temps are predicted to be in the 30-40’s and lows are going to drop into the teens in West Yellowstone. Accumulating snow is also a possibility. It’s been a spirited brawl so far this year. Will this be it for Summer? Is the fight over, or will Summer climb back into the ring like Jack Dempsey for another round? No one knows for sure. What we can say for sure is that the upcoming forecast, inhospitable as it is, will produce some excellent fall fishing conditions. Fall fishing revolves around hatches of Baetis mayflies and streamer eating brown trout, both of which flourish during periods of scuzzy weather. This year’s heavyweight slugfest has developed into a scuzzfest, and you can’t ask for a better situation on area rivers like the Madison, Firehole, Henry’s Fork, and Missouri. So, pack your puffy layers and Gore-Tex. Load your thermos and streamer box. Dig out your warmest socks and gloves. The next round of this year’s match is about to start. It’s sure to be a cold and wet one, but it might also be the most exciting round of the fight! If the forecast holds true, this will be an ideal week to fish the Madison and Firehole rivers in YNP. Scuzzy weather conditions will have migratory fish on the move, and active for most of the day in the Madison. On the Firehole you can expect to see good hatches of Baetis mayflies, though emergence times may be delayed until later afternoon hours if the temps are as cold as predicted. So, don’t be afraid to spend more time on the Madison swinging those flies, and head up to the Firehole in the afternoon. Then, as the hatch wanes on the Firehole, make your way back to the Madison for an evening session before dark. Keep an eye out for late hatches of Baetis and the fly formerly known as Pseudocloeon on the Madison in the evenings as well. It’s not widespread, but during heavy emergences those big, migratory fish will rise in certain places on the Madison in the park and provide some of the most exciting dry fly fishing of the season. Whether you are lucky enough to run into rising fish on the Madison in the park or up on the Firehole, remember these late season hatches are small (size 20-26), and these fish have been fished to for the entire season (some more than others). The dry fly game this time of year is as technical, and rewarding, as it gets. Long leaders, stealthy approaches, and perfect presentations are a must. Scuzzy, october afternoons afford experienced anglers an excellent opportunity to test their dry fly skills in the walk-wade section of the Madison River below Earthquake Lake. Large browns and rainbows are in the sneakiest of spots at this time of year, oftentimes right along the bank, and they want nothing more than to eat a well-presented dry fly. The trick, of course, is presenting a size 22 dry fly without drag in these tight quarters. Long, fine tippets and precise casts that implement just the right amount of slack while positioning the line and leader in the perfect spot so as to avoid drag, are as crucial as they are challenging. Cold, wet October conditions bring out impressive emergences of Baetis mayflies on the Madison. This is always an afternoon activity, and the colder the weather the later the hatch. In absence of a hatch, prospecting with a single, small Baetis imitation can produce a subtle rise from an impressive fish. Focus your efforts on the calm water and slicks in pockets near the bank. If you’re wading up to your knees, you have most likely spooked a good fish to get there. October is also a perfect time to hone your Euro-nymphing skills on the walk-wade stretch of the Madison. Flows are low and clear, and those prized fish have seen every type of strike indicator known to man by this point in the season. If you are clumsily pounding a strike indicator into the calm, clear pockets of the Madison around $3 Bridge or Raynolds Pass right now, you might as well be using a Common Merganser duck as a bobber, because those trophy fish that you are after respond in the same way; they leave. When done well, presenting nymphs on a tight line allows for a stealthy presentation without the risk of lining fish or spooking them with the plop of an indicator. It’s also ultimately effective for detecting subtle strikes on small nymphs from wary fish. In all of angling literature there may not be a more heralded river than the Henry’s Fork, and a more eloquent correspondent than Ernie Schwiebert. The following is an excerpt from Schweibert’s Nymphs Vol I depicting an October day on the Ranch section of the Henry’s Fork with another fine ambassador to the river, Rene Harrop. “…Harrop and I walked downstream to the top of The Braids. Few fish were working yet, and we sat happily in the grass before wading across. There were whiteface cattle beyond the river, and the sun was still bright on the half-domed summit of Grand Teton. We were talking about explorer John Colter and what this country must have been like in 1807. As the light finally began to drop, Harrop stood up to observe the lines of drift under the opposite bank. “They’re starting,”he said, his amazing eyesight scanning the distance. He was right. Several good fish were working quietly in the shadow of the opposite bank. Harrop led the way, and we negotiated the river slowly, watching for bank-feeders as we crossed. The fish were on the hatching Pseudocloeon duns when we started casting, but soon switched to the tiny chartreuse-bodied spinners. I found the fish opposite me more receptive to floating nymph imitations dressed in the Harrop style, with fat balls of pale synthetic dubbing to suggest the unfurling wings, until the hatching subimagoes ebbed and they switched to spinners. These pale green-bodied Pseudocloeon edmundsi (Heterocloeon anoka) flies had been hatching since early fall, sometimes mixed with Baetis parvus (Diphetor hageni) in the late afternoons. They were literally all over the current. We both took fish steadily that evening, and fish were still sipping spinners when I saw Harrop working slowly down stream. I was still playing a good fish when he finally arrived, careful to mute the pressure waves of his wading. He held back to avoid frightening the big fish until it finally surrendered to the net. He led the way in the gathering darkness, expertly negotiating the diagonal passage between two brushy islands where the current had shaped a shallow crossing before it shelved off again into a deeply scoured hole. The river itself was shallow, with a pea-gravel bottom, and we quartered downstream toward the opposite bank to avoid fighting it’s flow. Grand Teton and it’s sisters still glowed in the distance. Big flocks of geese were passing in the darkness, barking and yelping as they circled overhead. We had nearly reached the opposite bank when hundreds and hundreds of geese began dropping in the darkness, Circling and settling all around us, and filling the night with their magic. Schweibert penned this decades ago, and evenings like this are still commonplace today. The same bugs are still hatching, although we have renamed them, and you can find fish rising in many of the same spots. In addition to the Pseudos and Baetis that Schweibert describes you can expect to see Mahagony Duns, and the last of the Tricos in the coming week. Schweibert’s account is a great description of fishing back in the “Good ol’ Days”. It’s also a perfect reminder that not much has really changed over the years in the Ranch, and these will be the “Good ol’ Days” for future generations. At a time when so many of our Western fisheries are at odds with development, and increased use. It’s significant to have a place like the Railroad Ranch stretch of the Henry’s Fork where time seems to stand still. We’ve seen a little bit of everything this week in Yellowstone Country. From rain and snow to sun and blue skies; from hoppers and ants to Baetis and streamers this autumn has gone deep into the batting order, and it’s only the end of September. 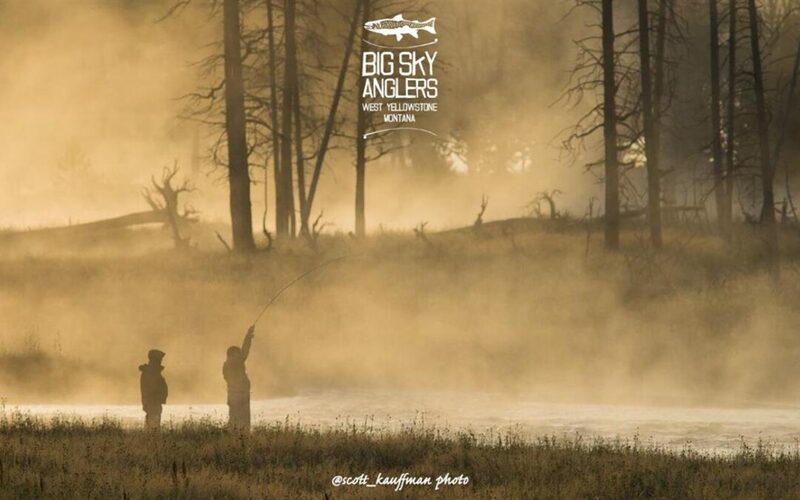 We have six weeks left until the close of fishing in Yellowstone park, and the un-official end to our 2018 fishing season. It’s ramping up to be a great fall, make sure you don’t miss out! Another strong autumn storm rolled through the region this week bringing valley rains and mountain snows, as well as thick hatches of Baetis mayflies. The storm clouds broke on Tues to reveal the most brilliant blue skies we’ve seen since last June, and a fresh coating of snow in the high country. Fall hatches of Baetis mayflies brought fish to the surface this week on rivers like the Madison, Gallatin, and Firehole. 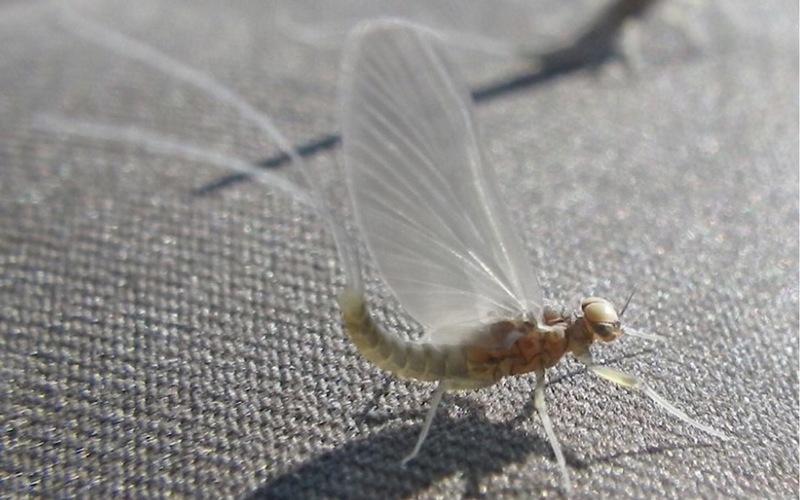 Mahogany duns joined the Baetis flotilla on both the upper and lower Henry’s Fork adding a much-welcomed, larger bug to the mix of small dry fly options. The upcoming forecast shows a chance of scuzzy weather again on Sunday, but otherwise, it looks like more sun and blue skies with temps in the 60’s. Our local wildfire, the Bacon Rind Fire, continues to smolder persistently above the Gallatin River roughly 23 miles north of West Yellowstone. This week’s storm tempered the blaze, but dry windy conditions afterward fueled more fire and smoke. Fishing access to the Gallatin River within Yellowstone Park from the Fawn Pass trailhead to the northern YNP boundary remains closed. The speed limit is 45 mph through that area as well. West Yellowstone Trout Spey Days II is a wrap. Huge thanks to everyone who came out with an open mind ready to learn or try something new. Also, thanks to all the vendors and presenters for sharing their knowledge and expertise with everyone. Last, but not least, thanks to Custer Gallatin National Forest for helping us share our awesome public lands and waters with you all. We’re already looking forward to next year’s event! We’re also looking forward to our second installment of Robert Van Rensburg’s Euro Nymphing Masterclass on October 6. CLICK HERE FOR MORE INFO on this exciting opportunity to learn from one of the world’s foremost experts on this fascinating technique. Fall storms are just what we hope for when fishing the Firehole and Madison Rivers in YNP. Scuzzy weather brings out the best in these late season fisheries, and this latest storm was no exception. Robust hatches of fall Baetis emerged during the scuzziest days and fish responded with surface feeding activity the likes of which we haven’t seen since last spring. Migratory fish from Hebgen lake were noticeably more active as well. Lower light levels had these lake fish on the move and feeling more aggressive. With sunny skies in the upcoming forecast you can still expect to see some rising fish on the Firehole, but not in the same numbers or in as many locations as the scuzzy days. Bring some small soft hackles to swing on the Firehole during periods without surface activity. On the Madison, concentrate your efforts to the morning and evening hours on bright days, and consider a slower, deeper presentation. The Madison River in Yellowstone Park is far from the only river with migratory brown trout in the greater Yellowstone area. This is the perfect time of year to get out and explore some of the smaller, less-popular brown trout fisheries. Large brown trout in dozens of other area waters are moving and staging in preparation for spawning season. Their fall colors are getting richer, and their levels of aggression are getting higher. This is also a great time of year to hunt for fall hatches of Baetis and Hecuba Drakes on Slough Creek and the Lamar River. Remember, cutthroat activity levels are directly proportional to water temps. When it’s 26 degrees at 8:00 am in the Lamar Valley your time would be much better spent with a thermos of coffee and a spotting scope looking for wildlife. Give those fish until the late morning or even early afternoon hours to warm up and get into the feeding routine. Baetis and streamers, hoppers and ants, scuzzy and rainy, sunny and clear; September’s multiple personality disorder continues on the Madison River. One day it’s gray and raw, the next it’s sunny and glorious. Just when we think the terrestrial bite on the Madison is surely over, the sun comes out and fish start looking for them again. It’s not the fast and furious action of last month mind you, but there are still some quality fish looking for hoppers and ants. Baetis hatches were intense during scuzzy weather days this week, and fish rose to them in select places, especially in the walk wade water from the Slide down past $3 Bridge. Large Browns are staging in some of the biggest and deepest runs on the Madison in the valley as they prepare to move towards spawning habitat. A streamer fished low and slow in these waters could be the ticket to social media stardom or a heightened sense of self worth. The Warm River to Ashton stretch on the lower Henry’s Fork is a terrific fall fishery. Every game that we like to play with a fly rod is available and fishing well these days. Deep nymphing under an indicator? Slam dunk! Whitefish are feeding voraciously in preparation for fall spawning season, and it’s nothing to put 50 of these strong fighting native fish in the net on a given day. Technical dry fly fishing with small flies? You bet! Daily hatches of Baetis and Mahogany dun mayflies have fish looking up throughout the stretch including some large browns sipping in sneaky spots along the bank. Dry/Dropper in shallow riffles and runs? Deadly! Everything from fun-sized to kilo-class trout occupy these shallow areas, and a dry/dropper rig is a great way to target these fish with a nymph, and still get the occasional eat on the dry fly. Early morning streamer run? Of course! Some of the biggest browns in the lower system come out of this stretch every year during salmonflies in the spring, and with streamers in the fall. Euro-Nymphing with the long rod? Assassin level, probably shouldn’t be allowed it’s so effective! With the proper technique and flies you can confidently approach any given run and expect to catch every fish in there…ok, unless your name is Robert Van Rensburg, that may be an exaggeration, but it’s damn effective. Elsewhere on the lower river fall hatches of Baetis and Mahogany duns have some large fish looking up and feeding consistently. 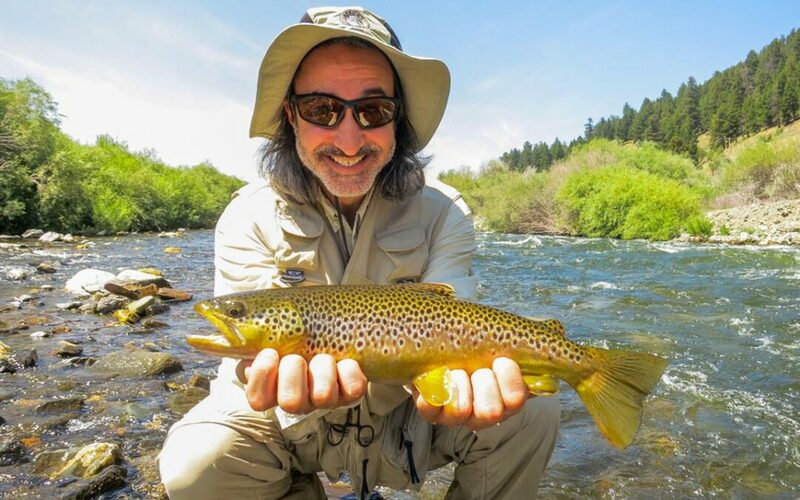 Otherwise, hoppers continue to dominate the dry fly game while streamers have produced early and late, and nymphs like a zebra midge have been good in the afternoons. Meanwhile, back at the Ranch anglers have been busy fishing a variety of bugs to increasing snooty, trophy-sized rainbow trout. Tricos, Callibaetis, Baetis, Mahoganies, ants, and hoppers have all been in the fly rotation and produced fish at one time or another. It’s a beautiful time of year to be in the Ranch hunting for that one true fish of a lifetime. The transition is over. It’s officially Fall in Yellowstone Country. Temps have been consistently below freezing in the mornings, autumn colors are in full effect, and the light has that unmistakable golden hue and low angle. Fall fishing is here as well. Fall hatches of Baetis mayflies can be found throughout the area, and migratory brown trout are on the move. The countdown is on. There’s six weeks left until the end of the season. Some of the most exciting fishing of the year will happen in the next month or so. Don’t miss out! We enjoyed some picture perfect weather this week with sunny skies and highs in the low 70’s, but consistently cooler weather is on the horizon. The long range forecast is showing a chance for moisture this weekend with highs in the 50’s and 60’s for the following week. The Bacon Rind fire continues to burn slowly north of West Yellowstone. Smoke and fire activity can be seen from hwy 191 along the Gallatin River in the Park stretch. Fishing access to the Gallatin River remains closed from Fawn Pass Trailhead north to the Yellowstone Park boundary. Speed is limited in this stretch to 45 mph. For the first time since last June the Firehole river and its neighboring waters, the Madison and Gibbon, top our list of Park waters to hit for the upcoming week. Water temps are in great shape on this side of the park, and fall hatches have started in earnest. With cooler, and possibly cloudier weather in the forecast, you can expect to see great afternoon hatches of Baetis mayflies on the Firehole. Keep in mind that the fall Baetis on the Firehole are a different species than those in the spring. They are significantly smaller, ranging in size from #22 to as small as #26. Long leaders of 10-12 feet and fine tippets down to 5x or 6x are required for these tiny dry flies. Stealth and a carefully presented fly are also mandatory for these late season dry fly sessions. While fall hatches can bring tremendous numbers of fish to the surface on the Firehole, they can be some of the most difficult and selective targets of the year. Migratory browns and rainbows from Hebgen lake are beginning to make their annual journey out of the lake and into the Madison River in YNP. Fish numbers seem fair for the end of September, but they are not what they will be in a few weeks. All of the usual haunts, from the Beaver Meadows up to the junction, have populated with some fish. 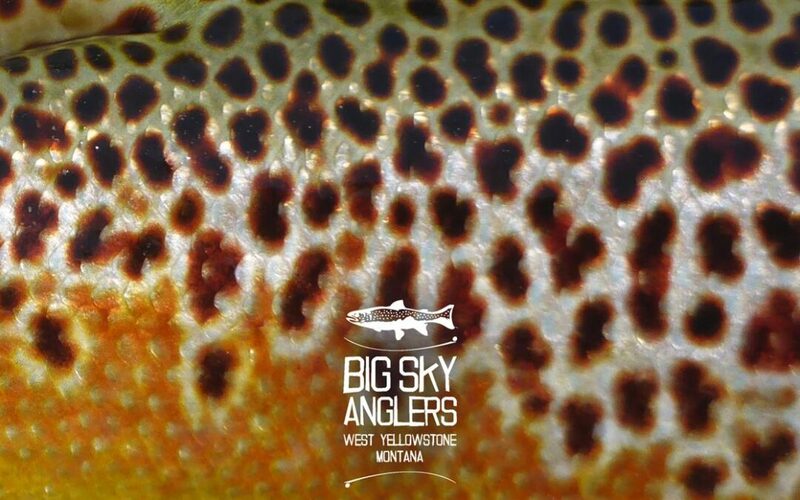 For the angler looking to find a big migratory trout on the swing or with a stripped fly, mornings and evenings, when the light levels are low, have been and will continue to be your best bets at triggering a strike from an aggressive fish. As we begin this fall season on the Madison in the park I would like to offer some thoughts on angling courtesy and etiquette. This is a fabulous fishery, but it is finite in that there are a limited number of holes that hold fish, and those holes are often separated by great distances. Over the years more and more anglers are fishing the fall run on the Madison, but the limited number of holes has stayed the same. This means you will many times have to share your water with your fellow angler. That doesn’t necessarily need to be a bad thing as long as you remember a couple of things. First off, there are a multitude of different angling techniques which can be used to target these fish, and no one has any more or less right to fish a hole because they are or are not fishing a certain way. It’s important to understand the limitations and expectations of different techniques and give appropriate space where required. 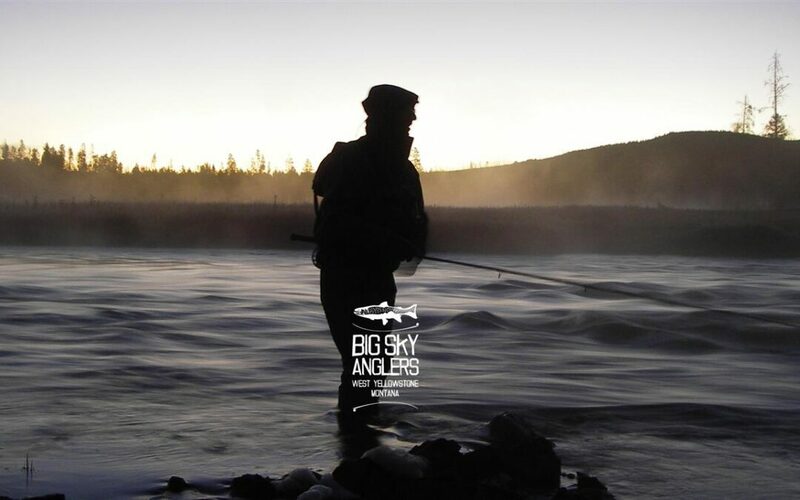 For example, a spey caster will most likely be traveling in a downstream direction making very long casts while a nymph fisherman will generally be fishing upstream with relatively shorter casts. Secondly, fall fishing on the Madison in the park was traditionally a very social endeavor. Anglers would gather every year at the same time to fish runs like the Barns Pools. Everyone would take their turn stepping down the run swinging their soft hackles and streamers. In between laps they would wait on the bank for their next turn, and chat about fishing and life. The same people would gather at the same holes during the same weeks year after year. They knew the names of each other’s kids and when someone lost a job or got a promotion. If you arrived at the river and weren’t sure what to do, someone would gladly give you some direction, or invite you to join in on the rotation. Glimpses of this still exist at times on the Madison in the park, especially at the Barns Pools. So, when you arrive at your favorite spot only to find that someone else has beaten you there, I would offer that the best way to figure out how your fellow angler is fishing and what he or she is planning on doing next is to simply have a little conversation. A few quick questions, and an easy “Hey, how’s it going?” Are usually all it takes to decide if you should jump in or head to another spot. We may have seen the last of our warm, sunny terrestrial afternoons this past week on the Madison. It’s time to start focusing on hatches of fall Baetis, nymphing, and streamer fishing. Keep a keen eye on the forecast the next few weeks. Whenever you ever see a scuzzy day there will be baetis hatching in the afternoons and fish rising to them. The walk wade stretch of the Madison from Quake Lake to Lyons bridge is especially fun on these gray, wet afternoons. It’s no secret that Quake Lake is home to some phenomenal brown trout, and the next month is a great time to target these fish with a streamer. With the end of the warm weather has come the end of our gulper season on Hebgen Lake. You may still find some rising fish from now until the ice covers the lake, but our days of consistently tracking fish are over until next season. Subsurface fishing remains a good option with leeches, Callibaetis nymphs, and chironomids. Remember, the youth weekend duck hunting season is this Saturday and Sunday, September 22 and 23. Hank’s pond continues to produce some impressive fish. Numbers aren’t high, but if you’re willing to grind it out, the rewards are. Whether you want to gage your skill against a Ranch rainbow, or chase a trophy brown trout in the lower river, the Henry’s Fork has a lot of options right now. Hatches of Tricos, Callibaetis, Baetis, Mahoganies, and the last of the ants can be found in the upper river. Baetis, hoppers, and streamers are the game on the lower river. The Box Canyon is flowing at around 340 cfs currently, and fishing well with the usual assortment of small beadhead nymphs. Mid stream troughs, slots, and buckets are the places to concentrate your efforts now, and be prepared to deal with some weeds. It’s mid-September in Yellowstone Country, and Fall continues to creep in with every passing day. The days are getting shorter, the mornings colder, and more and more aspens and willows are alive with autumn colors. We saw warm temps and the return of smoke over the last week, but cooler weather and the chance for precip is in the upcoming forecast. With colder nighttime temps, terrestrial season is coming to an abrupt end. Ants and hoppers are still around many of our area fisheries, but colder weather has made them less active, and fewer of them are finding their way into the water. It’s time to keep a keen eye out for fall hatches like Beatis, Mahogany Duns, and October Caddis. The streamer box is a must have from here on out as well. High winds and dry cold fronts continue to fuel the Bacon Rind fire which is burning between 23 and 30 miles north of West Yellowstone. Smoke is visible from the blaze above the Gallatin River in Yellowstone Park. Access to the Gallatin River has been closed from Fawn Pass trailhead north to the boundary of the park. Highway 191 is open, but the speed limit remains 45 mph through that stretch. Water conditions have been stable in the northeast corner of the park for several days and there is no appreciable precip in the forecast, but you should still keep an eye on flows before making the trip to fish the Lamar, Soda Butte, or Yellowstone in the canyon. You just never know what the weather will do up in the high country, and it doesn’t take much moisture to impact the Lamar when it’s only flowing at 160 cfs. Sometimes it seems like all you need to muddy the water is for two or three bison to relieve themselves streamside. With cold nights and cooling water temps there’s no need to be on the water before late morning. Terrestrial fishing is still holding strong in the Northeast Corner, but it may take until the afternoon for fish to really key on hopper and beetle patterns. Keep an eye out for fall hatches of Beatis and Drakes too. As the season chugs along, there are fewer and fewer fish in the caldera section (between Chittenden Bridge and Fishing Bridge) of the Yellowstone River. Mature fish slowly move back to Yellowstone Lake where they spend the winter preparing for next year’s spawning run / summer full of feasting on hatches and terrestrials. There’s still time to catch one of these magnificent Cutthroat trout, though, and September can have some outstanding hatches of Baetis and Heptagenia mayflies. Water temps on the upper Firehole River around Biscuit Basin and Mallard Creek are in great shape, and we’ve seen good numbers of fish rising to hoppers, caddis, and the first of the fall baetis hatches. Just like this Spring, we’re seeing consistently bigger fish on this iconic fishery. The Gallatin River is now closed to fishing access from the Fawn Pass trailhead north to the park boundary due to fire activity associated with the nearby Bacon Rind Fire. We all have our fingers crossed for a good shot of moisture to put that fire down before we miss much more of the fall season on the Gallatin in the Park. Who knows when that will happen, but those fish are going to be well rested whenever it is. As cliches go, no cliche is more cliche than “all good things must come to an end”. Cliche or not, it’s true, and it’s frustrating. I wish Michael Jordan was still soaring from the free throw line with his tongue hanging out. I wish they had never canceled the Fall Guy (Look it up, Millenials. It was awesome 80’s TV). I wish the cost of a new Ford pick up wasn’t double the average salary of a fishing guide. And, I wish the fantastic hopper fishing that we had all been enjoying for the past three weeks on the Madison hadn’t come to a screeching halt this week. It was bound to happen, and unlike the nostalgic 80’s references, we will get to fish hoppers on the Madison again next year. Though, this year was so good that you can’t help but wonder how long we will have to wait until we see it like that again. There’s still plenty of fun fall fishing to look forward to on the Madison. October Caddis, Fall Baetis, and Rhyacophila caddis have fish feeding actively both above and below the surface. The Madison’s brown trout are getting more rambunctious with every passing day, and the streamer game is getting better and better. The forecast is favorable for the end of the gulper season on Hebgen. Don’t expect much before late-morning, or even early afternoon, when it’s below freezing in the am. If it’s calm in the afternoon you might see the best gulper action of the season. Be sure to have the regular assortment of Callibaetis and Tricos, but don’t forget flying ants and hoppers. If you don’t see fish up on top, don’t despair! As winter begins creeping up on a lake, the trout enter a phase of aggressive feeding to pack on the pounds either prior to the long winter or prior to upcoming spawning runs. Feeding binges don’t always last all day, but an hour long bite can make 4 hours on the water well worth while. Fishing subsurface with larger offerings like buggers, leeches, baitfish imitations, and even large streamers can produce the biggest and fattest trout of the season for those willing to put in some time. With the onset of Autumn here in the mountains, Henry’s Lake has turned on. The fall feeding binge has begun as the weeds begin to die back, and anglers are seeing some truly large hybrids this year. During low light conditions, larger leeches and buggers are a smart place to start, matching the weight of the fly and sink rate of your line to water depth. In brighter conditions, go smaller with scuds or Hank’s Pond classics like the Mighty Mouse. No fish finder? Simply clip your hemos onto your fly and lower them down to the bottom to measure, or use the anchor rope. Find the depth where the fish are feeding through experimentation. You will know for sure when you get it right. Cloudy, September days are a special time in the Ranch, and the forecast is looking favorable for the next week. Mahoganies and Baetis, as well as the last of the Tricos and Callibaetis are at the top of the list. It’s probably a good idea to keep the terrestrial box handy too. The Warm River to Ashton stretch has been a standout so far this fall. Hoppers, nymphs, and streamers have all produced some nice brown trout recently in addition to the standard supply of “fun sized” rainbows and gracious whitefish. The lower river below Ashton is cooling down nicely and seeing some of the first good fall hatches of psuedos and baetis.